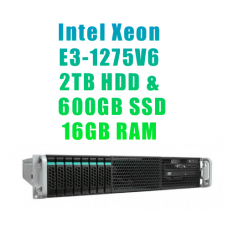 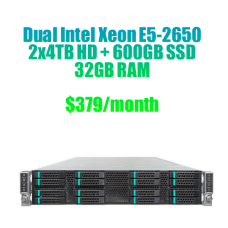 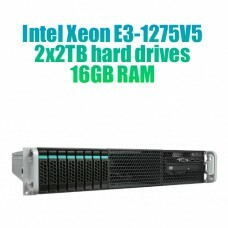 What's included with this server : Dual Intel Xeon E5-2620, 2.5GHz Turbo, 12Core/24Logical processors-2x2TB enterprise hard drives (Raid-1mirrored or JBOD) -64GB DDR3-1600 ECC Reg. RAM -1Gb..
What's included with this server : Dual Intel Xeon E5-2620, 2.5GHz, 12Core/24Logical processors-2x4TB enterprise hard drives (Raid-1mirrored or JBOD) -64GB DDR3-1600 ECC Reg. 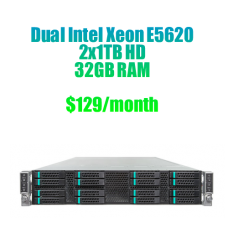 RAM -1Gbps net..
What's included with this server : Dual Intel Xeon E5-2620, 2.5GHz, 12Core/24Logical processors- 2x4TB enterprise hard drives + 300GB SSD (Raid-1mirrored or JBOD) - 64GB DDR3-..
What's included with this server : Dual Intel Xeon E5-2620 v3, 3.2GHz Turbo, 12Core/24Logical processors-2x2TB enterprise hard drives (Raid-1mirrored or JBOD) -32GB DDR4-2133 ECC Reg. 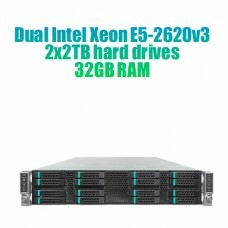 ..
What's included with this server : Dual Intel Xeon E5-2620 v3, 3.2GHz Turbo, 12Core/24Logical processors-2x4TB enterprise hard drives (Raid-1mirrored or JBOD) -32GB DDR4-2133 ECC Reg. 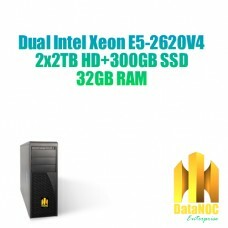 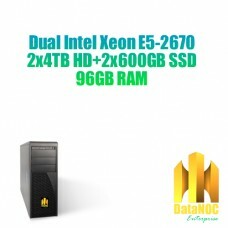 ..
What's included with this server : Dual Intel Xeon E5-2620 v3, 3.2GHz Turbo, 12Core/24Logical processors-2x2TB enterprise hard drives and 1x600GB SSD (Raid-1mirrored or JBOD) -32GB DDR..
What's included with this server : Dual Intel Xeon E5-2620 V4, 3.0GHz Turbo, 16Core/32Logical processors-2x2TB enterprise hard drives+300GB SSD (Soft Raid/JBOD) -32GB DDR4-2133 ECC Reg..
What's included with this server : Dual Intel Xeon E5-2620 V4, 3.0GHz Turbo, 16Core/32Logical processors-2x4TB enterprise hard drives+600GB SSD (Soft Raid/JBOD) -32GB DDR4-2133 ECC Reg..
What's included with this server : Dual Intel Xeon E5-2620 V4, 3.0GHz Turbo, 16Core/32Logical processors-2x6TB enterprise hard drives+600GB SSD (Soft Raid/JBOD) -32GB DDR4-2133 ECC Reg..
What's included with this server : Dual Intel Xeon E5-2650, 2.8GHz Turbo, 16Core/32Logical processors-2x2TB enterprise hard drives (Soft Raid/JBOD) -32GB DDR4-2133 ECC Reg. RAM -1Gbps ..
What's included with this server : Dual Intel Xeon E5-2650, 2.8GHz Turbo, 16Core/32Logical processors-2x4TB enterprise hard drives (Soft Raid/JBOD) -32GB DDR4-2133 ECC Reg. 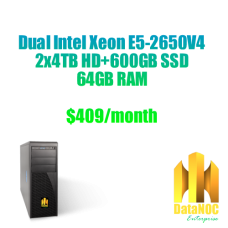 RAM -1Gbps ..
What's included with this server : Dual Intel Xeon E5-2650, 2.8GHz Turbo, 16Core/32Logical processors-2x4TB enterprise hard drives and 600GB SSD (Soft Raid/JBOD) -32GB DDR4-2133 ECC Re..
What's included with this server : Dual Intel Xeon E5-2650 v3, 3.0GHz Turbo, 20Core/40Logical processors-2x2TB enterprise hard drives (Soft Raid/JBOD) -64GB DDR4-2133 ECC RAM -1Gbps ne..
What's included with this server : Dual Intel Xeon E5-2650 v3, 3.0GHz Turbo, 20Core/40Logical processors- 2x4TB enterprise hard drives (Soft Raid/JBOD) - 64GB DDR4-2133 E..
What's included with this server : Dual Intel Xeon E5-2650 v3, 3.0GHz Turbo, 20Core/40Logical processors-2x4TB enterprise hard drives and 600GB SSD (Soft Raid/JBOD) -64GB DDR4-2133 ECC..
What's included with this server : Dual Intel Xeon E5-2650 V4, 2.9GHz Turbo, 24Core/48Logical processors-2x2TB enterprise hard drives (Soft Raid/JBOD) +300GB SSD -64GB DDR4-2133 ECC RA..
What's included with this server : Dual Intel Xeon E5-2650 V4, 2.9GHz Turbo, 24Core/48Logical processors-2x4TB enterprise hard drives (Soft Raid/JBOD) + 600GB SSD -64GB DDR4-2133 ECC R..
What's included with this server : Dual Intel Xeon E5-2650 V4, 2.9GHz Turbo, 24Core/48Logical processors- 4x2TB enterprise hard drives (Raid5/JBOD) - 64GB DDR4-2133 ECC R..
What's included with this server : Dual Intel Xeon E5-2670, 3.3GHz Turbo, 16Core/32Logical processors-2x4TB enterprise hard drives (Raid-1mirrored or JBOD) -2x600GB SSD drives (Raid-1mirror..
What's included with this server : Dual Intel Xeon,	E5620, 2.4GHz,5.86GT/s, 8Core/ 8Logical processors-2x1TB enterprise hard drives (Soft Raid/JBOD) -32GB DDR3-1333 ECC Reg. 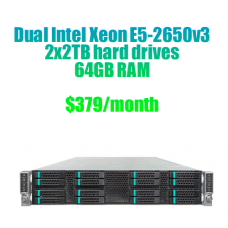 RAM -1Gbp..
What's included with this server : Intel Xeon E3-1275V5, 4.0GHz Turbo, 4Core/8Logical processors, 8MB Cache, -2x2TB enterprise hard drives (Soft raid or JBOD), -16GB DDR4-2133 ECC ..
What's included with this server : Intel Xeon E3-1275V6, 4.0GHz Turbo, 4Core/8Logical processors, 8MB Cache, -2TB enterprise HDD and 600GB SSD, -16GB DDR4-2133 ECC RAM, -1Gbps ne..
What's included with this server : Quad Intel Xeon E7-4809 v3, (20M Cache, 2.1GHz), 32Core/64 Logical processors-4X2TB Enterprise hard drives (Raid5/JBOD) -128GB DDR4-1866 ECC RAM -1Gb..